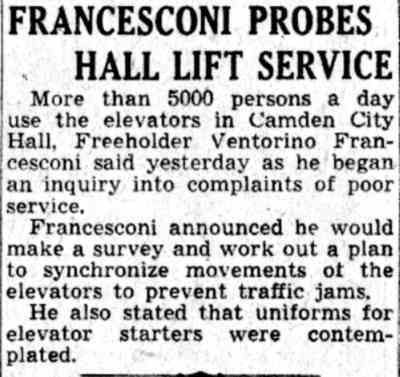 VENTORINO FRANCESCONI was active politically as a Democrat in South Camden in the 1930s and 1940s. “I am going to show you some pictures we took down there, showing the facilities. The first picture is of the [Steven's] School itself. Eighteen years ago, I went to that school and they were patching it .... This second picture shows the facilities being used by the girls-the roof is coming down, water on the floor, no seats. The third picture shows the facilities being used by the boys. I would not want my child to use these facilities, and I am sure that none of the members of the Board would want your children to use them .... The last picture is ... of the inside. This shows the plaster coming off the walls. It has been patched up several times before. A WPA Project is working there now. 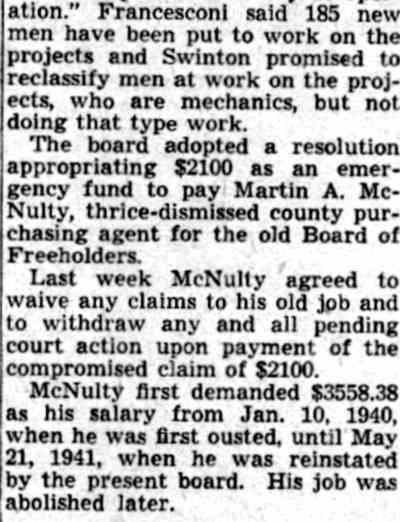 Board of Education member Shaw informed Francesconi that board did submit an application in 1938, and showed him a letter from the PWA. 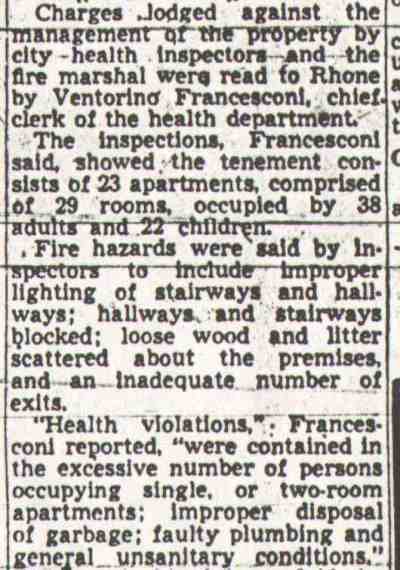 In April 1939, the WPA notified the board that they approved the board's application for improvements to Central, Central Annex, Mickle, Yorkship, Stevens, and H. B. Wilson Schools.When the 194 Camden City Directory was compiled, Ventorino Francesconi and his wife lived at 447 Benson Street. 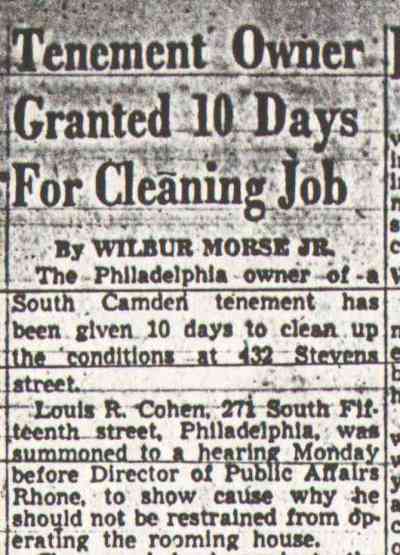 He was then working for the City of Camden as the Deputy Director of Public Affairs. Sir-I want to take this opportunity to thank all the workers and all my friends in the Fourth Ward who so loyally supported Mrs. Mary Di Pilla and myself as county committeewoman and county committeeman. Unfortunately Mrs. Di Pilla lost by four votes; but won a moral victory. I will do all in· my power to serve the people of the Fourth Ward to the best of my ability and under no circumstances will I show any partiality. James Laurino, was elected president of the Fourth Ward Democratic Club of Camden last night at its headquarters, Broadway and Washington streets. Other officers chosen are John Stewart, vice president; Joseph Panichella, secretary; Dominick Lombardo, re-elected treasurer; Fred Ross, financial secretary; Thomas Shannon, sergeant-at-arms. County Committeeman Ventorino Francesconi was named honorary president. 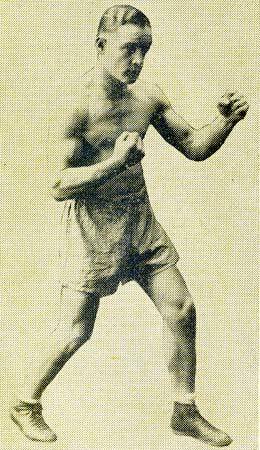 David Visor was named to draw up by-laws. The charter is open for new members. The club will meet each Wednesday night. Street; Raymond J. Steward, 650 Washington Street; Harry J. Goldberg, 915 Broadway; Patrick J. McVeigh, 25 South Forty-first Street; Jack Kriede, 1579 Park Boulevard; Irvin Berlin, 574 Pine Street; Ventorino Francesconi, 426 Benson Street; Andrew J. Smith, 1123 North Eighteenth street; Clarence D. Leigh, 1300 South Sixth Street . Commissioner Mary W. Kobus, director of public safety, is to be among seven witnesses tonight be­fore the grand jury investigating election frauds in Camden. This was announced yesterday by Assistant Prosecutor Patrick H. Harding after Circuit Court Judge V. Claude Palmer took under advisement the application of Republican attorneys to unseat Democratic Freeholders Stanley Ciechanowski and Ventorino Francesconi. 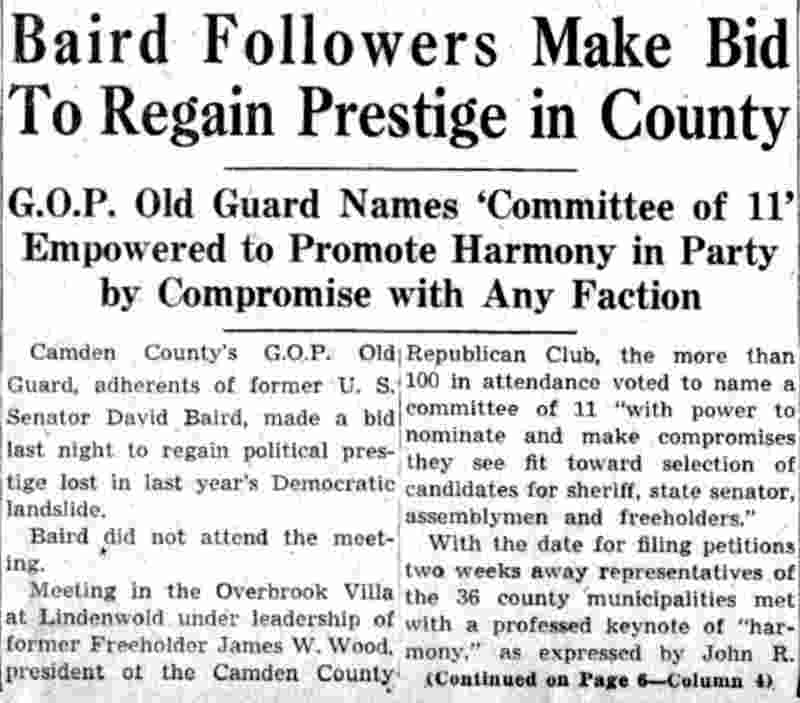 The court was asked to "declare the election of their Republican opponents, Charles A. Burkett and George Farrell, because of “fraud, corruption or malconduct" in nine precincts of five Camden wards "sufficient to permit the court to reject the entire vote in those districts." 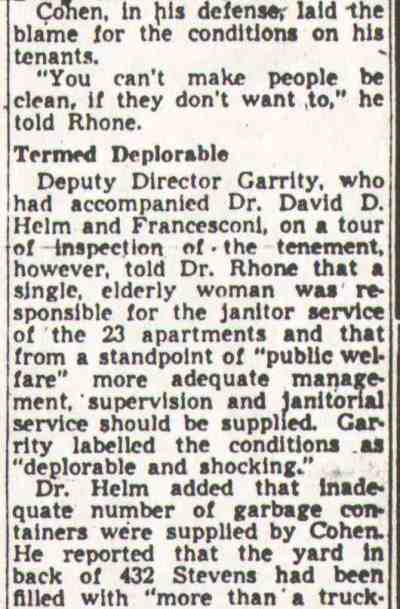 Mrs. Kobus was summoned before the grand jury with six other persons whose identities were not revealed by Harding. It was reported the jury intended probing the police and firemen's pay increase referendum in the last election, of which there has been considerable testimony in the ballot tampering hearing. It is understood the jury wants to learn where police and firemen were stationed on election day. In final arguments before Judge Palmer, attorneys did not ask the court to rule that the election of Freeholder Albert H. Molt, three-year term incumbent, be set aside. The lawyers admitted the total vote with the nine district eliminated does not nullify Molt's majority over Howard Westcott, G.O.P. three-year candidate. Democrat attorneys combatted the argument of the Republicans with the claim the court does not have the power to set the whole district aside but only those votes found to be illegally credited to the incumbents or taken away from the petitioners. "Giving the petitioners (Republicans) the benefit of every doubt and crediting to them the votes they contend the losing candidates were deprived of by alleged illegal means, the three Democratic freeholders still maintain substantial pluralities to continue in office" Alex Feinberg, attorney for the Democrats, told the court. After declaring the attorneys for the freeholders failed to produce evidence to refute testimony given that "hundreds of ballots were tampered with by persons other than the voter," Benjamin Friedman, counsel for the Republican candidates, went into a minute review of the results of testimony at previous sessions of the fraud hearing. He characterized the persons who made the illegal markings as "culprits" and "stupid individuals without any degree of finesse." In district by district, he pointed out the total number of ballots on which there had been erasures and markings by “from one to five persons other than the voter." He told the court that one of the districts where ballots had been tampered with, the Fifth precinct of the Fourth ward, was the home district of Freeholder Francesconi but he added he did not wish the court to think "he should be charged with comp1iance in the fraud,"
"I think it is significant to point out that in the Eighth and Ninth precincts of the Seventh ward where most of this fraud was carried on there were only a few so-called blank ballots on which the voter made no choice for three-year term freeholder while in every other precinct in the city, there were anywhere from 35 to 50," Friedman said. 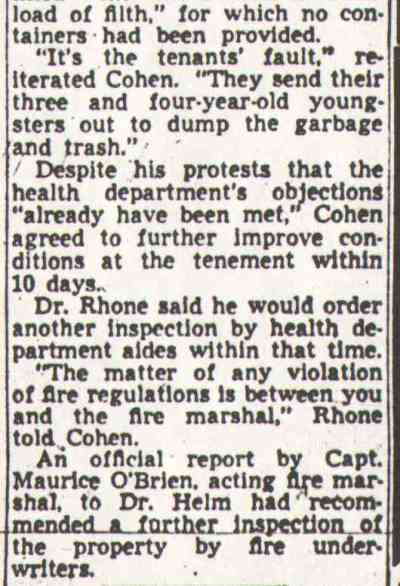 "In the Eighth precinct:, there were four blanks and two of those were soldier ballots and contained no freeholders' names. In the Ninth, there were two, both soldier ballots." "That's not hard to understand. Whoever was taking care of the ballots saw to it there would be no blanks. That is perfectly obvious,"
Friedman then charged members or the hoards of the disputed districts with “getting together” and working out what they would say in court. "They knew we had discovered fraud' very early in this recount," Friedman charged. "They had plenty of time to get together and work this thing out and decide they would come into court and say they knew nothing about it. That's what they did when the court questioned them. I am convinced that everyone who participated in this activity of these boards has direct or indirect knowledge of this fraud,"
"I think that it is true beyond question because on the ballots I gave these members to mark, there were three or four markings which are identical with the fraudulent markings on the ballots examined here during the course of the hearing,"
Friedman continued his argument to state the "boxes in question smell to high Heaven and the odor permeates every vote contained in them." . "The fraud we have shown in four of these districts and the substantial variations in the others is more than enough to challenge the election," Friedman said. "These boxes are rife and reek of fraud and the results of the districts are fraught with doubt and fraud and should be thrown out." After Palmer asked that the districts which showed "substantial variation" be set aside, Judge Palmer defended the officers of those districts by declaring "it takes much concentration to be accurate after sitting 26 hours in a row." "I urge that we have proven without question that because of the fraud, malconduct or corruption in the Sixth, Eighth and Ninth precincts of the Seventh ward and the Fifth precinct of the Fourth ward, and the substantial variations in the Fourth, Tenth and Twelfth districts of the Thirteenth ward, the Seventh district of the Eleventh ward, and the Second district of the Fourteenth ward, the votes in all these districts should be rejected." Friedman then pointed out to the court that if all the votes were rejected and deducted from the six three-year term freeholder votes, the result would be: Burkett, 57,277; Farrell, 57,265; Molt, 57,111; Westcott, 56,858; Ciechanowski, 55,517, and Francesconi, 54,931. Most of Feinberg's argument was confined to a review of the testimony during the fraud hearing and a mathemetical calculation of the method, he claimed, for the vote to be adjusted because of the evidence of tampering. He also cited numerous laws which he contended were the basis for his argument: "all the voters of a district should not be disenfranchised because of illegal practices of some unknown person or persons." "The cases are clear in holding that a district cannot be rejected in its entirely and the results of an election challenged unless the court is without a method of determining arithmetically that the election is changed," Feinberg said. “There has been no evidence of illegal ballots being cast in this contest. The only evidence concerns something done after the votes were cast and of which the voter had no knowledge. I maintain that can not disfranchise all the votes." Feinberg claimed that after giving the losing candidates all the votes claimed for them and after taking away all the votes claimed to have been illegally given the incumbents, the county-wide results would be: Molt, 61,216; Ciechanowski, 59,571; Francesconi, 58,999; Farrell, 58,529; Burkett, 58,521, and Westcott, 58,126.